Capcom Co., Ltd. (Capcom) is pleased to announce that the Takarazuka Revue will present a stage production of "Prosecutor Miles Edgeworth: Ace Attorney 3" in January 2013. In the "Ace Attorney" game series, players take on the role of a defense attorney who fights for the lives of his clients. 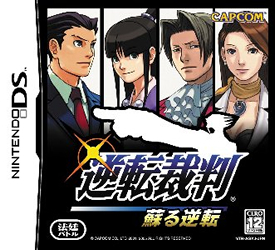 The first game in the series was released in October 2001, and since then, this popular courtroom battle series has gone on to ship over 4.3 million units worldwide (as of June 30, 2012). Capcom has also used this game for mobile phone games, comic books, character goods and other products. "Ace Attorney" has also been used for a live-action movie and a concert by the Tokyo Philharmonic Orchestra. All of these activities have been very successful. Takarazuka Revue, which will celebrate its 100th anniversary in 2014, has decided to present a stage show of the latest title in the "Ace Attorney" series in 2013. In 2009, Takarazuka Revue presented "Phoenix Wright: Ace Attorney" and "Phoenix Wright: Ace Attorney 2", recording total attendance of more than 50,000. The two "Ace Attorney" shows were very successful as the first tie-up between Takarazuka Revue and a game. Furthermore the shows attracted many people who would not normally see a Takarazuka show and raised awareness of games among people who would normally not play games. As for prior "Ace Attorney" shows, the Takarazuka Cosmos Troupe will perform the show and Kei Suzuki will do the script and staging. The show will star Hiro Yumi, who played the role of the rival in the previous productions. This time, the plot is completely different than in the previous two shows that feature the activities of a talented attorney. "Prosecutor Miles Edgeworth: Ace Attorney 3" is a new story featuring a cool and clever prosecutor named Miles Edgeworth (Reiji Mitsurugi in Japanese). The story gives the "Ace Attorney" series an entirely new type of appeal. As always, we at Capcom will continue to pursue our Single Content Multiple Usage strategy by making advancements on new hardware to maximize sales while leveraging our brands to bring maximum satisfaction to as many of our users as possible. 1. Title "Prosecutor Miles Edgeworth: Ace Attorney 3"